Even if you relegate these glass mugs to bachelor party souvenirs, we bet your guys will be clinking them for years to come. 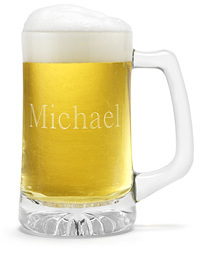 Each engravable mug holds 14 oz. of brew. 5 1/2"h x 4 3/4"w. Engrave with two lines of text.